You have come to the right place if you are looking for fun, engaging and exciting Noah’s Ark themed activities to do with toddlers, preschoolers and kindergartners. Our activities are widely used by teachers, moms, dads, child care providers and more! 1) Cut 5 3 in. circles from white posterboard. One set for each child. 2) On the first circle, have the children make an ark out of toothpicks or craft sticks broken into shorter pieces. Depending on your age group you may have to draw the shape and have them fill in with the chosen material. also have them color the bakground to look like hills, sky etc. 3) On the next circle, have them draw the background again and then glue animal crackers in matching pairs. 4) On the 3rd circle, have them glue cotton balls for clouds and silver tinsel for the rain. 5) On the 4th circle, draw a bird head and have them glue on feathers. Take a green chenille stem and bend it into two loops to look like leaves and glue to the bird’s mouth (the dove returning with the olive branch). 6) Have the children draw a rainbow. You could also use scraps of tissue paper for them to glue on for the rainbow. Paint a piece of construction paper blue(sky) on top and green(grass) on the bottom. Cut a paper plate in half and paint one half brown(the Ark) We cut out two white clouds and one yellow sun, and glued them on top. We glued animal crackers all around the Ark and on the green grass. We also typed Gen.7:8-9 (All creatures, male and female, came to Noah and entered the Ark. I reinforced the Masterpiece on cardboard and glued yarn on the back to use as a hanger. Give each child a precut ark shape from sandpaper or corrugated cardboard. They glue these on to another paper. They can draw, paint or glue blue paper on for water, if desired. Use animal crackers for animals, these can be glued on. Cotton balls for clouds, Q-tip painting for rain, etc. 1) Make a boat basket with two ark shapes. Decorate. Glue or staple sides and bottom together. Make a rainbow handle. Fill with animal crackers to take home. 4) Collect fairly large boxes to use to *sit* in (boats) for story time. A big refrigerator box could hold two or three children. 6) Make rainbow necklaces (fruit colored O-shaped cereal) and munch. 7) Trace each child’s hand on a different colored paper and make a rainbow of hand prints to place down at eye level. 8) Bring in a large container to fill with water! Bring items, such as small plastic boats to float in it! Or corks are great, too! Make a mosaic rainbow, use small squares of paper the colors of the rainbow. Draw a small arch on each child’s paper. This will give them a guideline for the bottom color on the rainbow and they can keep adding the colors on. They glue on the squares , one color at a time. Use paper olive branches or leaves. Hide them throughout the play area. Designate one child as Noah. The rest of the children are doves. Noah says “Fly away and bring me a branch” The children scatter and look for the branches. When they find one they return with the branches. Designate a new Noah who can hide the branches and repeat the game. Second child repeats what the first said and adds their own animal. Each child must remember what has been said and add their own animal. I do this until all the kids have their snack. Then I pour all the drinks and tell the kids everyone who has Jesus in their heart can line up for their drink. They love to play this and actually ask me to do transitions this way. How about making boats for science? I would start out with sink and float activities. You provide water table and various items to sink and float. Children make predictions about which will sink and which will float, then try them out. Next, provide various materials to construct boats, i.e., wood, styrofoam, paper, model magic, foil, milk cartons, etc. Can they make a boat that floats? Which of these materials floats the best and makes the best boat? Can you make a boat out of duplos that floats? How many little plastic animals can you get on your boat before it sinks? It would also be interesting to look up different animal pairs. How are the males and females different in appearance and why? After this examination, it might be fun to provide arks made of paper stapled together like and envelope. The kids could draw pairs of animals and cut them out and put the in the ark. Or….. Make a giant ark and make it a group project. Kids add their animals to the ark when they complete them. If you have animal stamps that would be another art project. Since the story relates to rain, you could do rain and rainbow art activities. I like making rainbows with paper plates on old turntables. Use water color pens, then cut the plate in two to make a rainbow. Rainbows with biocolor and scrapers are fun. Draw rainbows on filter paper that is folded, then spray with water and unfold. Make rain by putting liquid water color in spray bottles and spraying paper outside. Drip paint from brushes onto paper to make rain. 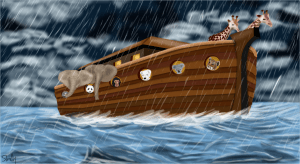 What about developing some water activities, floaters and sinkers, building boats…..what could Noah use/not use to build a boat…..what might cause his boat to sink or float…..what kind of boat would you build if you were Noah? Can you set up a work bench?…what kind of tools might Noah use to build his boat?….use hammers…nails…child size hand drill….well supervised–child size saw. Was it easy or hard to use these tools? Noah chose 2 of every kind…..what else comes in 2’s?…..play matching games. Animal hunt….have 2 pictures of each animal…give each child one and hide the other…can they find the matching animal to go on the ark? develop sound effects to go with your story…..use rhythm instruments… what instrument sounds like rain….like Noah….like the different animals….what sound shall we make when the storm stops and the sun comes out etc. etc. 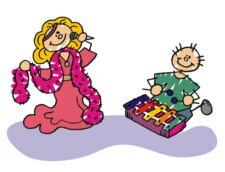 OR make your own instruments…..make rainsticks….make sound shakers…maracas etc. etc. Add objects to the water table that float or sink. One item to add that makes children think and discover is balloons with different objects inside such as: sand, baby powder, a block, marbles, toothpicks, and just air. Have bowls with water, objects to add to bowl, Put objects in bowl until it overflows. Have children estimate how many things can go in. FUN. is of high interest to children. Take a closer look at one of the animals on the Ark. Put rainwear items in a bag; umbrella, raincoat, rainboots. Have the children try to guess what is in the bag by asking questions. Have a child pull out one item, talk about what it is used for. Have as many children as items come up and use the items as intended. Mention that it is not raining in the classroom, so they don’t really need these things. Tell them “What if I told you it was going to be raining today when we leave?” “Suppose I asked you to wear the raingear all day so that you would be ready?” “Would you get hot?” “Would it be hard to play?”, etc. Then you can lead into the story of Noah and how he was asked to get ready for a big rainstorm long before the rain actually started. Talk about weather, rain, water, etc. Children love pretending. Act out playing in the rain. Children”pretend” to put on rainboots raincoat, rain hats, hold and put up umbrellas. Walk around in the “rain”. Put puddle shapes outlined with yarn for the children to jump over or into. Using water table or dishpan of water and several objects. Have the children predict which items will sink and which items will float, then try them. These character qualities can all be applied to the children in very practical ways. and shine and give God the glory, glory, children of the Lord. build it out of gopher barky, barky children of the Lord. and shine and give God the glory, glory children of the Lord. Elephants, and kangaroosies, roosies, Children of the Lord. Almost drove the animals crazies, crazies. Children of the Lord. Everything was fine and dandy, dandy, Children of the Lord. This is the way the elephant walks going to the ark. This is the way the kangaroo hops. This is the way the horses gallop. This is the way the rabbit hops. This is the way the tigers creep. Great help. Thanks so much. Such a wonderful ideas!!!! Awesome!!! Thank you so much!!!! !